It’s March and a few teaser warm days have got many of us thinking of spring! The trouble is, while we long for sunny days and warm weather food, we’re still a little ways off from the fresh, bright tastes that come with a summer salad. I love soups, stews, and other one-pot wonder meals, but honestly, nothing sends me swooning faster than the fresh crunch and refreshing taste of a veggie-filled salad. Thank goodness there’s more to salad than just butter soft lettuces, as cabbage, kale, and other greens make a crunchy, satisfying base. Last year I wrote about this delicious winter salad made with red cabbage, tart apples, and carrots, and while I still love it, this winter I’ve fallen in love with using raw kale as my base. Sometimes you can find tender, baby kale leaves which are just perfect for salads, but even if all you have is a bunch of mature, larger leaves, don’t worry! You can still soften them up a bit and come up with a tasty salad base. Kale is unbelievably good for you. Many people shy away from using it fearing it will be too bitter, or tough for them, but I’m here to tell you to step up and embrace kale! You can add it to soups or stews and it will soften up nicely, or you can just sauté it with onions and garlic for a tasty side dish. But raw kale in a salad is also incredibly delicious, and in its raw form you’re not losing out on any nutrients that are sensitive to heat and could be lost during cooking. So, how do you take kale leaves and transform them into something tasty and tender that you can use in a salad? The key is to let them “marinate” for a short time in small amount of dressing and let the acid of your vinegar or lemon break down the fibres a little bit. I like to wash and dry my torn or finely sliced leaves and then rub the dressing over them and let them sit while I prep the rest of the salad. Kale is also an ideal candidate for a portable salad in a jar! Make it the bottom layer, along with other harder veggies like celery, carrots or fennel, and keep adding to the salad layers until your softest items (tomatoes, oranges, feta, avocado, etc.) are on the very top. Screw the lid on, and away you go! Depending on what you add, a salad made like this would keep in the fridge for a few days. If you use regular lettuce leaves, or spinach as your leafy green addition make sure to add it to a layer that is away from the dressing so it doesn’t go all mushy. For one of my more recent kale salads I concocted something using what I had in my fridge, which truthfully, was very little! It was absolutely delicious, so I’m going to share it! Keep in mind, this is a salad – you’re not baking bread or anything, so measurements can be loose, and you can add and subtract to suit your personal tastes. Wash and dry kale leaves. Toss them with the dressing, rubbing the leaves so that they are well-coated. Let them sit like this while you prep the remainder of the salad. 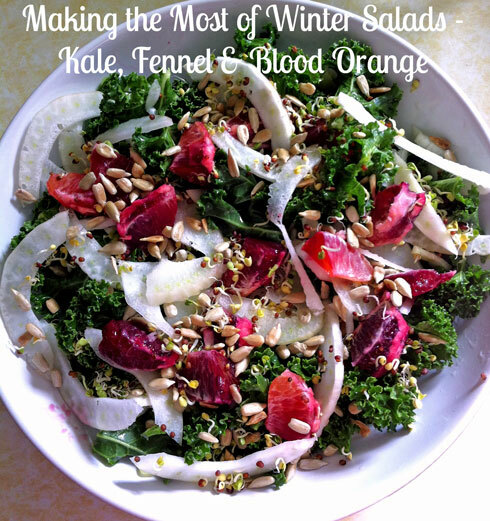 Layer the fennel, orange, and sprouts on top of the kale leaves. Top with sunflower seeds and feta and eat up! You could add a chopped, boiled egg, or some avocado, and any other vegetable that strikes your fancy! Like I said, I used the veg I had in my fridge and the pickings were slim.